REDWOOD CITY, Calif., Sept. 18, 2018 /PRNewswire/ -- Digital transformation is accelerating for every company in every industry, everywhere around the world. As a part of this necessary transition, people, software and machines are creating and consuming data faster and in more distributed locations than ever before, creating dissonance and driving businesses to private and direct Interconnection to solve their complex integration challenges. 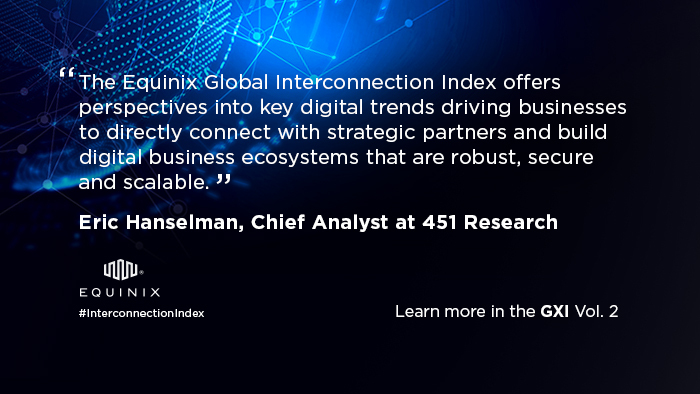 According to the second annual Global Interconnection Index (the "GXI"), a market study published by Equinix that analyzes traffic exchange globally, Interconnection, or direct and private traffic exchange between key business partners, is becoming the defacto method for companies to operate in today's digital world. Interconnection Bandwidth provisioned for this purpose is forecasted to grow by 2021 to 8,200+ Terabits per second (Tbps) of capacity, or the equivalent of 33 Zettabytes (ZB) of data exchange per year, a dramatic increase over the previous year's projection and ten times the projected capacity of internet traffic1. This represents a significant five-year compound annual growth rate (CAGR) of 48%, almost double the expected 26% CAGR of global IP Traffic. 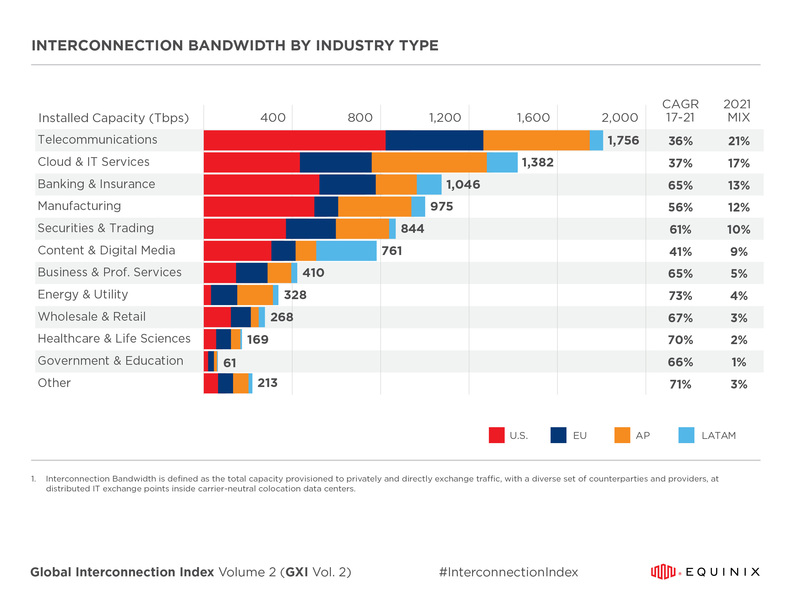 "Significant macro, technology and regulatory trends are converging to form an unprecedented era of complexity and risk and forcing the integration of physical and digital worlds," said Sara Baack, Chief Marketing Officer for Equinix, Inc. "The second volume of the Global Interconnection Index has found that companies are solving their increasing digital requirements by directly connecting to key business partners through Interconnection, as traditional forms of connectivity do not meet the demanding requirements of today's businesses." Digital Business Transformation, which drives the need to support real-time interactions between people, things, locations, clouds and data to enable value capture. At least 50% of global GDP will be digitized by 2021, with growth in every industry driven by digitally enhanced offerings, operations and relationships2. Cybersecurity Risk, which expands Interconnection consumption as firms increasingly shift to private data traffic exchange to bypass the public internet and mitigate against digital threats as data is distributed across a growing number of vulnerability points. Large-scale cybersecurity breaches are one of the most serious risks facing the world today, and the scale of the threat is expanding drastically. By 2021, the global cost of cybersecurity breaches is projected to reach US$6 trillion3. Business Ecosystems, which are experiencing an increase in mix of customers, partners and employees and require digital ecosystems and Interconnection to scale. By 2021, organizations using a mix of intermediaries are projected to more than double, and active engagement with industries outside the organization's native industry are projected to nearly triple4. Network Optimization to shorten the distance between users and services applications. Hybrid Multicloud to connect and segment traffic between multiple clouds and private infrastructure. Distributed Security to deploy and interconnect security controls at points of digital engagement. Distributed Data to deploy and interonnect data analytics in proximity to users. The GXI provides significant insight into regional differences in how growth in Interconnection Bandwidth is accelerating in different regions of the world. United States: As an early adoption market for digital business and the headquarters for the largest number of multinational enterprises, the United States is expected to see compound growth of 45% per annum, contributing more than 40% of Interconnection Bandwidth globally. Europe: A growing number of regulations requiring data compliance is serving as a catalyst of growth for Europe, which is predicted to grow 48% per annum, contributing to 23% of Interconnection Bandwidth globally. Asia-Pacific: Benefiting from rapid urbanization and home to many of the largest digital content providers, Asia-Pacific is anticipated to grow 51% per annum, contributing more than 27% of Interconnection Bandwidth globally. Latin America: Emerging market dynamics and growing digital business adoption positions Latin America for expected 59% per annum growth, contributing more than 9% of Interconnection Bandwidth globally. The GXI also forecasts Interconnection Bandwidth growth by counterparty categories, estimating the Interconnection behavior of each. Surpassing all other categories, Interconnection between Enterprises and Cloud and IT Providers is projected to grow 98% per annum through 2021, supporting businesses building out new digital services and migrating existing workloads to third-party cloud platforms. "We see a huge transformation in the healthcare industry, particularly when it comes to securely managing data. Enabling flexible and efficient connectivity across our enterprise, the internet and cloud providers allows us to efficiently capture, analyze and distribute data from many disparate sources. It provides a key strategic advantage in scaling our business and creating value for our customers. We view Interconnection as a fundamental building block of IT infrastructure today." "As enterprises increasingly adopt hybrid cloud architectures to accelerate their digital transformation initiatives, Interconnection is a proven design strategy for reaching cloud services such as Oracle Cloud Infrastructure in an efficient manner. Direct and private interconnection to Oracle Cloud Infrastructure FastConnect network connectivity platform helps provide predictable and consistent performance, isolation and availability." "As enterprises realize the value of their application capital and adopt multi-cloud architectures as part of their digital transformation, interconnection designs provide an efficient and secure way to leverage cloud services." "As enterprises chart their paths to greater digitization, they seek pathways that avoid the turbulence generated by the growing complexity of integrating various digital services. New architectures anchored by Interconnection smooth this complexity and, increasingly, enterprises are finding that they also yield improvements in security, performance and capacity. 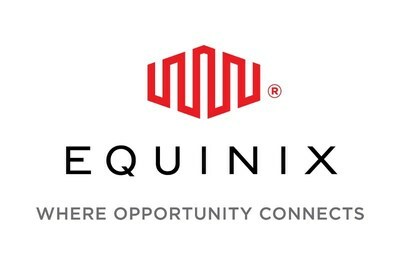 Equinix's Global Interconnection Index provides useful insight into these digital trends including why businesses are directly connecting with strategic partners to build their digital business ecosystems." 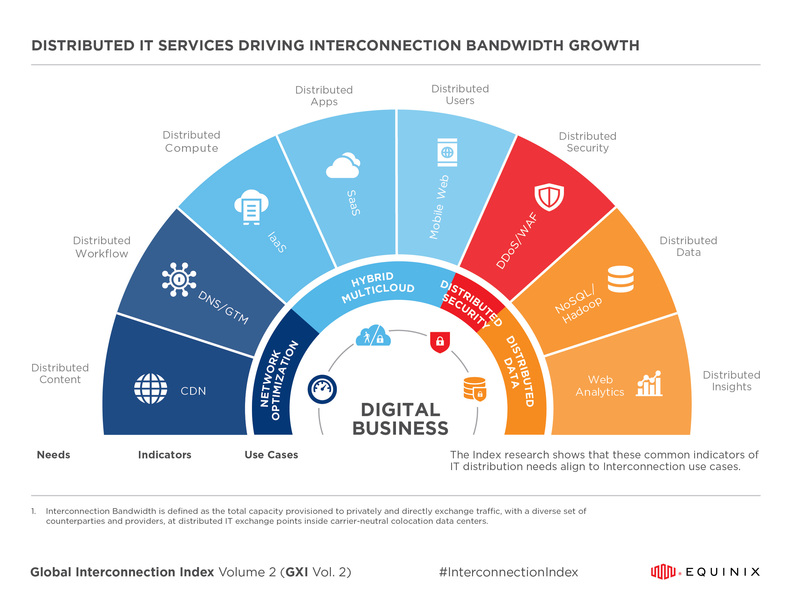 The Global Interconnection Index, published annually by Equinix, delivers insights that drive digital business advantage by tracking, measuring and forecasting growth in Interconnection Bandwidth—the total capacity provisioned to privately and directly exchange traffic with a diverse set of counterparties and providers at distributed IT exchange points. As crucial as Interconnection is to how digital business is conducted, it has never been quantified. 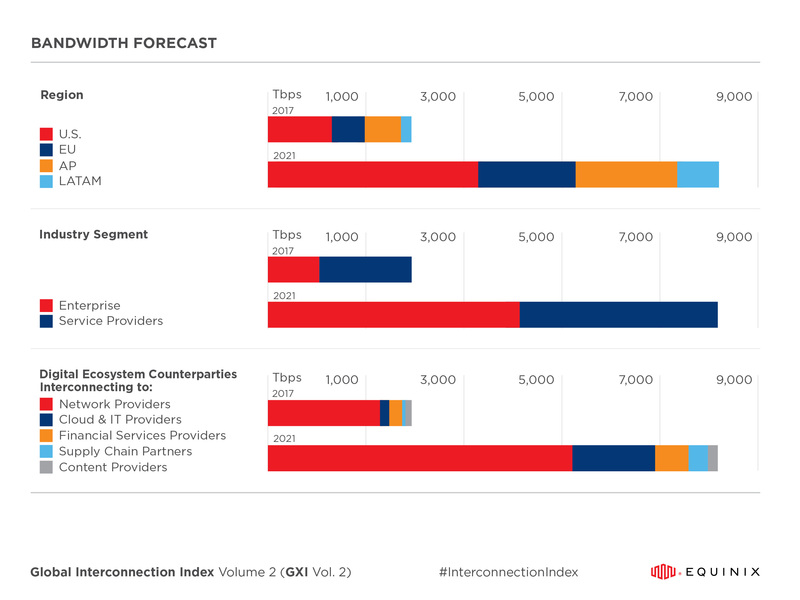 The Global Interconnection Index changes this with industry-first projections of how Interconnection growth and access will unfold through 2021. The report serves as a market baseline that analyzes the deployment profile of thousands of ecosystem participants using carrier-neutral colocation data center providers globally. This data was combined with local and regional market data (including macroeconomic trends, market demographics and industry concentrations), and with key demand drivers of digital business, to form a weighted demand multiplier to assist in predicting growth to factor the impact of digital business transformation. A detailed methodology description is included in the Global Interconnection Index. The four classes of Interconnection use cases were developed by analyzing more than 1,800 industry implementations worldwide, are documented in the IOA® Knowledge Base, and have been validated by IT practitioners and industry experts.